The Oasis Valley remained isolated until the late 1870's. The only occupants up to that time were the Western Shoshone and Paiute Indians. Being hunter gatherer's, the Beatty area was a natural place for their temporary camps, with plenty of water and small game to support their population. In August of 1904, Shorty Harris and Ed Cross found gold in what is now part of Death Valley National Park. Shorty being fond of his "Ol' Be Joyful" Bar Whiskey, spread the word of their new mining claim. As word spread of these newfound riches, it did not take long for miners and prospectors to head into the area. Montillius (Old Man) Beatty had been ranching and mining in this area for over 30 years. He had purchased the Lander Ranch in the spring of 1896 and settled down with his Paiute wife to ranch and raise their family. Montillius was one of three white men in the Oasis Valley at the time and always opened his home to anyone that would pass through on their way to the mines in Death Valley. Being an old miner himself, he knew what was in the wind with the news of the new gold find. Robert (Bob) Montgomery, along with his brother had founded several mines in the Panamint Range. 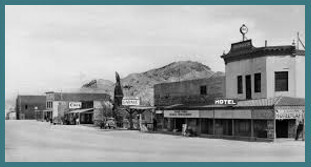 By 1901 he had moved to Tonopah where he worked as an optician and jeweler. 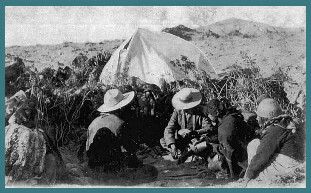 When he heard about the Harris/Cross find, he hired a Shoshone Indian that had helped him in his Johnnie Mine to help locate a claim for him in the new mining area. The Montgomery Shoshone mine was founded and thus began one of the biggest and shortest lived gold rushes in the Death Valley/Nevada area. Now we have all the players in place for the birth of a new town. Robert (Bob) Montgomery had done some mining exploration with Mr. Beatty in the late 1890's, so he was familiar with the ranch. He purchased a large area of the Beatty Ranch to plat a town site. While the nearby town of Bullfrog was already in place, they could not supply water. With Bob Montgomery's town, the miners and businessmen would have plenty of water, which made his town site much more appealing. Bob Montgomery named his town site Beatty, in honor of Montillius Beatty. Mr Beatty was also the first Postmaster, and seemed to thrive on all the activity happening on his old Ranch. Mr. Beatty also had an interest in an area in Death Valley known as Cow Creek. He would alternate his time between his ranch and Cow Creek migrating back and forth as the Native Americans had been doing for many centuries. Three months after the start of Beatty (Oct. 1904), the Busch Brother's platted the town of Rhyolite. Rhyolite was destined to be the third largest town in the State of Nevada by 1908. Although Beatty never reached a population of much over 650, it became the supply center for all the other mining towns in the Bullfrog Mining District. 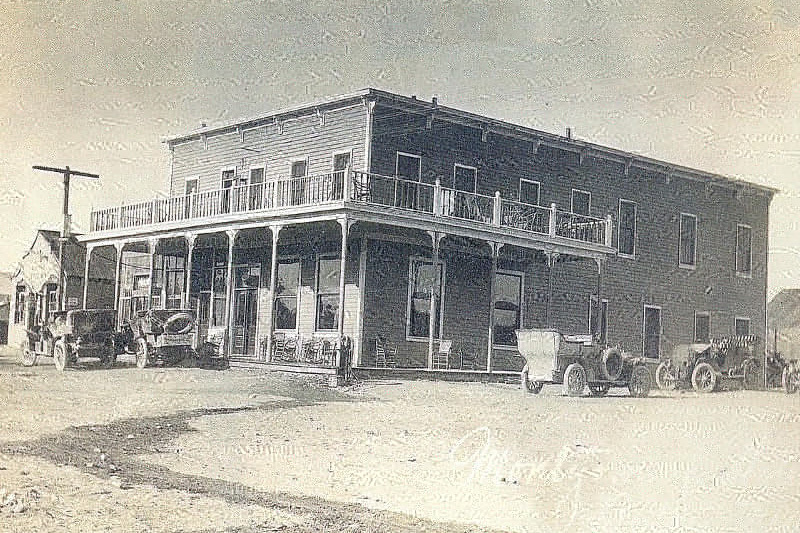 With an Ice House, several Hotels, Saloons, Newspaper, Fresh Produce, Meat Markets, and General Mercantile's, Beatty had everything that anyone could want, including plenty of water. Beatty's first newspaper was the Beatty Bullfrog Miner, which began publishing in 1905 and went out of business in 1909. The Montgomery Hotel in 1905. 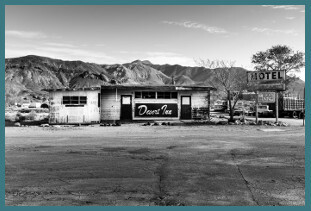 It was owned by Bob Montgomery, namesake of the Montgomery-Shoshone Mine in nearby Rhyolite. This was located at the corner of 3rd and main. It was opened in 1905 by Bob Montgomery. Was dismantled and moved to Pioneer in 1909. Later it burned down. There is a church there now that has been converted into the VFW Post 12108 John Strozzi. In March of 1907, one of the most important real estate transactions occurred. 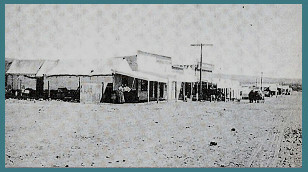 Robert (Bob) Montgomery sold the town site of Beatty to Dr. W. S. Phillips of Chicago and E. S. Hoyt of Tonopah for $100,000. Wanting to promote their new town, they backed Railroad Days and it was said to be one of the biggest seen in Nevada. A train from Los Angeles, California carried many investors and party goer's free of charge to the town of Beatty, where they were treated to fresh fruits, seafood and champagne as they disembarked from the train. Although the trains ran a day late, the town of Beatty wined and dined their new investors. This was one of two free train rides that the investors from California would take to the town of Beatty. Although it was later found that Dr. Phillips had started one of the largest scams of the time, it gave Beatty the jump start that it needed. Now only with the ingenuity of the citizens of Beatty, was this town going to survive. With no town manager or city government to promote their town and the mining interests, they elected their own and kept Beatty alive. 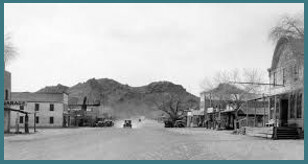 With new roads being built between Beatty and outlying towns, it was becoming the center of travel as early as 1906. With passenger trains, stage coaches, automobile stages, you could go just about anywhere from one convenient location. 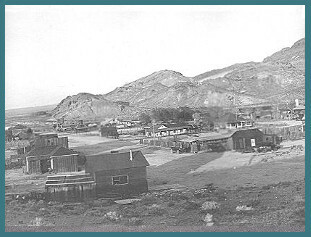 As the gold ran out, towns started collapsing, and by 1914 Beatty had become the largest town in the Bullfrog Mining District. Beatty remained a railroad hub until 1940 when the railroad was placed into maintenance. By 1942, the tracks were pulled up by the Dept. of War Office for use in World War II. 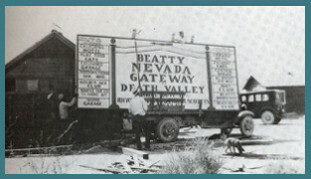 Beatty now had to depend on the automobile traffic and the newly developed Highways from Reno to Las Vegas. 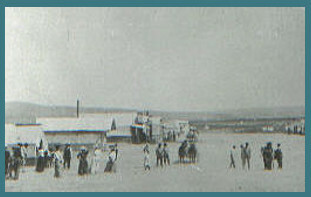 Although still a mining town, Beatty would start catering more and more to tourism. Known as the "Gateway to Death Valley" since 1933 when Death Valley was declared a National Monument by President Herbert Hoover. Beatty has embraced tourism by expanding economic opportunities to provide restaurants, motels, and information to the area's historic sites. With the establishment of the Nevada Test Site in 1951, and the proliferation of Nuclear Arms Testing, Beatty took on a new task. Many of the young men growing up in the area started working on the Test Site which is still one of the main employers of many Beatty residents today. 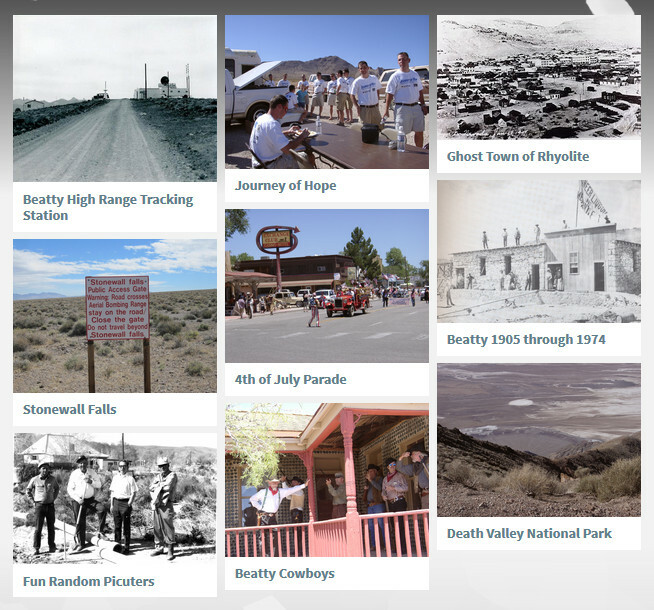 From Mining to Railroads, Atomic Bombs to Tourism, Beatty has had many faces since October of 1904. Still a thriving community of 1,000 residents, Beatty offers diverse opportunities to visitors and residents alike.